Dr. Krupesh Thacker, the CEO & Founder of Krup Music also believes in the concept of “Giving Back”. He started a social initiative of “Gift of Time” events from February 2014. The mission was to bring smiles to the faces of less privileged people by spending a quality time with them on various occasions. 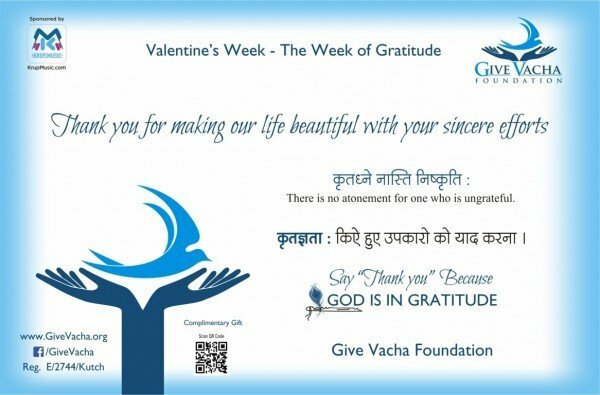 People started joining hands to the initiative from the beginning and in 2015 officially the registered NGO “Give Vacha Foundation” was started. GV Foundation is a “No Donation NGO” and only accepts “GIFT OF TIME”. The foundation is backed by Krup Music Record Label. Vacha Thacker is the official Brand Ambassador for the NGO. Celebrated from 7th Feb – 14th Feb each year by “Expressing Love to Everyone”. The event got started from February 2014 when around 450 people from different cities of India did unique celebration of the festival. In February 2015 the event got bigger. TV9 was the official media partner for the event. From February 2016 various colleges started joining the celebration. The details about unique celebration can be found here. Official Music video for the Valentine’s Week was released by Krup Music in 2014. From 2015, unique friendship’s day celebration event celebration started on the concept of “God is in True Friend”. Many social activities were planned to bond the true friends. One of the concept of Valentine’s Week is date with daddy, where youngsters express their love to parents through different activities. From March 2016 the 3rd initiative started by “Rainbow Women’s Day Workshop”, where girls from different colleges were given daylong training on various topics by the experts. These events include birthday, anniversary and other occasions celebration at orphan age, old age and with special need children. Thank You for Your Time and Support to Our Activities. Anyone can volunteer in the NGO. Please contact us to be a Helping Hand.